So you bought your first camera... now what do you do? If you're struggling with your first steps in DSLR or mirrorless photography, rest assured you're not alone. And we're here to help. 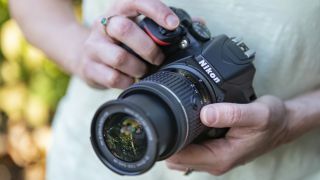 Whether you've just bought your first camera or just need to brush up on your shooting skills, we've got an all-in-one guide to getting to grips with your new DSLR. We'll start off this photographic crash course by explaining - in simple terms - how exposure works, so you can capture perfectly exposed shots every time with your first camera. We'll show you the importance of choosing the best aperture and depth of field for different subjects. We'll also reveal all you need to know about shutter speed, for freezing subjects or capturing a sense of movement in your scene. And we'll pass on expert advice for getting the best possible results with your first camera when the light is getting low. Then we build up to focusing, to help you get sharp shots whatever you're shooting, and how to avoid common autofocus pitfalls. We'll round things off with a photo composition masterclass, explaining the best ways to approach and compose your shots. The two main elements you use to take an exposure are aperture and shutter speed. The aperture of a lens ranges from wide to narrow, and is measured in f/stops, such as f/4 (wide aperture) to f/22 (narrow aperture). The wider the aperture, the more light is let in to reach your camera's sensor - brightening your shots. The narrower the aperture, the less light is let in - darkening your shots. Shutter speed, on the other hand, dictates the how long your camera's shutter stays open for, and so also controls how much light reaches the sensor. When you change your lens's aperture setting, you affect depth of field (DoF). The depth of field refers to the amount of your scene that's acceptably sharp. Using a wide aperture (such as f/5.6) will result in a 'shallow' depth of field. This is why wide apertures are ideal for shooting portraits and wildlife, as you can blur the backgrounds behind your subjects to really make them stand out in the scene. Using a narrow aperture (such as f/16) results in a greater depth of field. This is why narrow apertures are perfect when shooting landscapes and cityscapes, as you want to ensure your scene is acceptably sharp from the foreground through to the background area. Final tip: Use Aperture Priority mode to control your apertures. In this semi-auto mode, your DSLR will then set the shutter speed for a standard exposure. A good starting point when metering is to use your camera's multi-zone metering modes (sometimes called evaluative or matrix). You can then brighten or darken them quickly using your camera's Exposure Compensation control when shooting in in Aperture or Shutter priority shooting modes (Av or Tv on Canon cameras).